The tuning lead screw may be seen adjacent to this B plus lead. Here is where tuning adjustments are best made. The rf output that will go to the input of the 432 mc converter is the larger coax cable, type RG-54A/U. If you use I II: or type N plugs, connect on the end of this cable. The cathode resistor is a 39 ohm unit which replaces the original 1500 ohm (R-8) one and this component as well as the heater leads are clipped on to the prongs of the 416B tube with tube socket clips. Since the diameter of the grid ring of the 416 B is of the same approximate diameter as the grid ring of the 2C43, perfect fit is obtained and very effective grounding is secured for t:\e new tube. 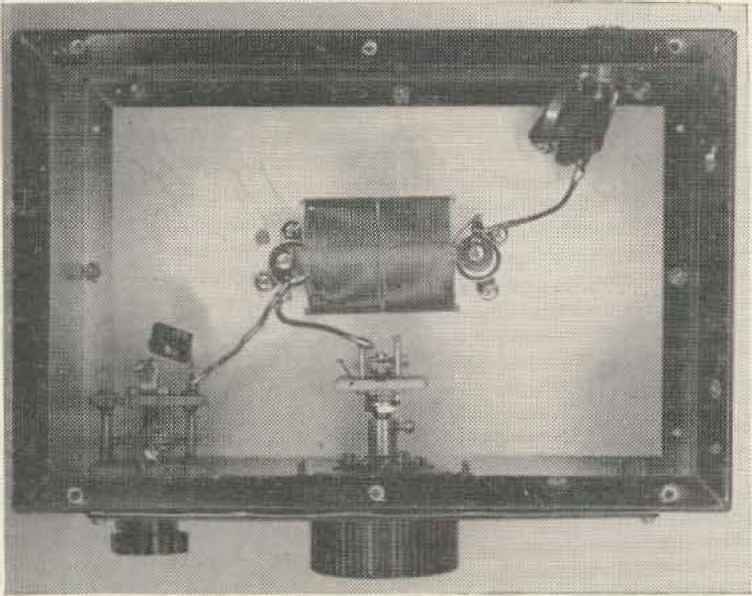 The cathode securing fingers on the underside of the square cathode plate may be bent inwards a bit and thus a secure fit will be obtained on this element of the 416B, which is ]*" in diam< as contrasted to 1" in diameter for the 2C ¿3 tube. Little need be said here. Voltages are set, connections to the antenna and input of the 432 converter are then made and the unit tuned to frequency with the circular tuning plate, A signal generator will be useful at this point, but lacking that, a 432 signal or even a bit of ignition noise may be employed. After the tuning disc is locked down, the lead screw at the rear of the cavity may be used to peak the frequency. fiers as this, an out of town weak signal is the best one can do, short of professional test gear. Nothing will take the place of a 432 mc buddy some couple of hundred miles who will put on his tfiV" wheel and let you have at it for a few minutes each day, This practice is universal around this area among the UIIF boys and it is highly recommended. By alternately using the pre-amplifier and then going around it, one can tell very quickly if the score is favorable. Some workers have stated that a small variable employed in place of the fixed 50 pi ceram-icon as shown here was used to advantage. No improvement could be noted at this location. but it is certainly worth a try if you are so inclined. Xo bragging will be done to finish off this writing. Four different types of 432 preamplifiers have been and are being used here at W5AJG, three using 416B tubes and one using 8058 Nu vis tors. All give equally good results—by good results is meant a definite improvement in S/N ratio over not using them at all. As far as a statement about an absolute improvement in no'se figure is concerned, this is beyond our eapa bility at this time. After all, one might have a fantastically low noise figure (perhaps by accident) but be burdened with a questionable antenna or a rather poor uhf location and not even hear signals his good friend across town hears with just so-so receiving gear. am the unfortunate one. Don't we all?